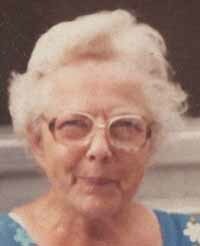 Lucille Margaret Broschofsky, better known as "Grandma Lucy" to friends and family, was born in Waubek, N.D., on Nov. 18, 1919. She spent the majority of her life in Minneapolis, Minn., where she wed John Lawrence Broschofsky in 1943 and raised two children, Nancy and John. Preceded in death by her daughter and husband, Lucille moved to Ketchum, Idaho, in 1990 to be near her family. Lucy was a woman of many talents. She was formally trained as a beautician and ran her own salon for many years in Minneapolis. Having helped raise her five siblings, Lucy had a knack for keeping a tidy home and was self-taught in many trades. She could cook the best meal you had ever tasted, enjoyed knitting, braided colorful rugs, maintained beautiful gardens, loved "adopting" the neighborhood children and enticing them with her delicious baked goods, and lived on her own until her last day. She lived to see her great-grandson, Lennon, born in December. She will be missed by her son, John, and his wife, Minette, and grandchildren Marina and Rudi. Lucille passed away peacefully at home on June 15, 2011. Thank you to Hospice of the Wood River Valley for wonderful caring help.